The new joint venture aims to provide a stable supply of competitive batteries to multiple automakers. Toyota Motor Corporation and Panasonic Corporation announced Tuesday that the two companies will establish a joint venture next year to produce prismatic lithium-ion batteries, solid-state batteries, and next-generation batteries for electric vehicles. Contracts concluded today confirm earlier reports of a formal partnership between the two companies, and build on an agreement that the pair announced in late 2017 to explore developing batteries with higher energy density in a prismatic cell arrangement. The new joint venture aims to provide a stable supply of competitive batteries to multiple automakers — sold principally through Panasonic — as the EV market grows to meet evolving consumer needs and to address societal issues related to energy and climate change. "As vehicle electrification accelerates toward the solving of such environmental issues, batteries are a most important element,” Toyota and Panasonic said in a joint statement. The joint venture seeks to address these issues by drawing on both companies’ resources and expertise. Toyota will bring to the table its EV market data, manufacturing experience and advanced technologies related to solid-state batteries, while Panasonic will contribute its ability to make safe, high-capacity and high-output batteries at scale, as well as a customer base in Japan and abroad. Equity participation in the joint venture will be split 51 percent for Toyota and 49 percent for Panasonic. Pending approval from competition law authorities, the partnership will officially launch by the end of 2020. Toyota, which has been slower than other automakers to embrace EVs , announced in 2017 that it aims to sell more than 10 battery-electric models by the mid-2020s, contributing to sales of 5.5 million electrified vehicles by 2030. The new joint venture will help to support that effort. Today’s announcement also reflects the growing competition among battery manufacturers, according to Mitalee Gupta, energy storage analyst at Wood Mackenzie Power & Renewables. While Panasonic has been a Tier 1 lithium-ion battery cell supplier for several years, she noted that Chinese vendors such as CATL and BYD have been ramping up their battery cell production and gaining market share. “This strategic partnership shows that Panasonic is now looking beyond Tesla to keep its place in the race to capture the global EV market, by leveraging Toyota’s position as one of the biggest automakers,” said Gupta. Tesla, one of Panasonic’s highest-profile customers, announced recently that it is looking at other cell suppliers for its Shanghai Gigafactory, including local Chinese companies. Reports this week show that Tesla has been in talks with China’s Tianjin Lishen, but that no deal has been reached to date. Around 60 percent of global cell manufacturing currently takes place in China, according to Gupta. South Korean vendors such as LG Chem and Samsung SDI are in the process of setting up manufacturing bases in the country to ensure that they aren’t losing out on this global competition, she said. Toyota’s joint venture with Panasonic will also include factories in China, as well as Japan. 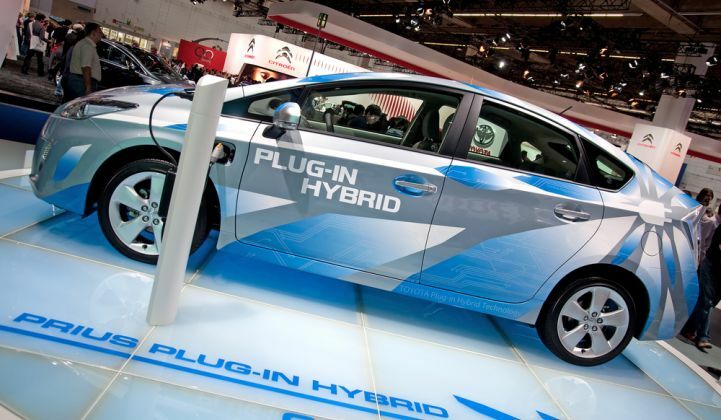 Through the joint venture, Toyota and Panasonic have also committed to researching and developing solid-state batteries, a technology that according to Wood Mackenzie Power & Renewables will start becoming commercially viable after 2025. Last year WoodMac tracked more than half a billion dollars worth of investments in solid-state technologies from automakers and cell suppliers. “With the EV industry collectively trying to focus on improving energy density of today’s battery cells and overcoming current challenges with cobalt cathodes and graphite anodes, these investments are going to grow rapidly in the coming years,” said Gupta.